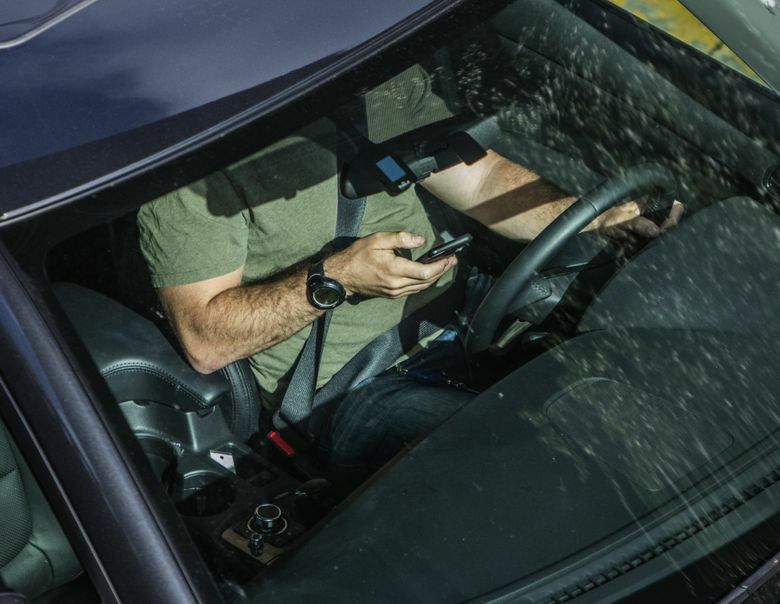 Washington state’s new distracted-driving law is now in effect. Here’s what you need to know to avoid a ticket. No more excuses, public-safety officials say. On the road, off the phone. But would you actually be charged the $136 fine for violating Washington state’s new anti-distraction law, which takes effect Sunday? That depends on where you drive. The Washington State Patrol will ease into a six-month grace period, when troopers issue warnings and hand out educational cards. “In the end, for us, it’s all about compliance. We want people to be safe on the road, we don’t want to issue tickets,” State Patrol spokesman Kyle Moore said. Seattle police and Snohomish County deputies intend to similarly focus on education, then implement fines a few months from now. On the other hand, the King County Sheriff’s Office, which patrols 13 cities and towns as well as county roads, will immediately treat electronic distraction like other violations. Deputies will use discretion to cite or warn, based on severity, a motorist’s record, or the person’s attitude. “Why wait six months, when sometimes the only message that will get through to people to change their behavior is to actually receive a citation?” said Sgt. Cindi West. Redmond police are expected to issue fines immediately, without a grace period. Bellevue police will give warnings for two weeks before issuing fines, as prescribed by city traffic codes. And be sure to put the phone away in Colfax, Whitman County — where generations of westsiders have been speed-trapped on the highway to Washington State University in Pullman. Police write about 100 tickets a week, to tame as many as 10,000 vehicles some days passing through the town of 2,828 people. Police and firefighters in Colfax responded to and then grieved for resident Sam Thompson, 20, who died in a head-on crash while texting and driving nearby in 2014. His grandmother, Lavera Wade, testified this year for Senate Bill 5289, the Driving Under the Influence of Electronics Act, which passed in a display of bipartisanship. Last year, 156 of the 537 roadway deaths in Washington state were blamed on distraction of various kinds, as were 572 of the 2,208 serious injuries. The law forbids handheld uses. Not just phone calls, but composing or reading any kind of message, social media post, photograph or data. Drivers may not use handheld devices while at a stop sign or red-light signal. All video watching is illegal, even in a dashboard or dash-mounted device. Common built-in electronics, including hands-free phones, satellite music and maps, are legal. Handheld phone calls to 911 or other emergency services are legal, as are urgent calls between transit employees and dispatchers. Amateur radio equipment and citizens-band radio remain legal. Q. What does “minimal use of a finger” mean? Police will use their judgment. State Patrol Trooper Rick Johnson, a spokesman based in Bellevue, sees it this way: “The idea is for you to activate your phone with one touch, so you don’t have to look away from your windshield to dial 10 numbers, to make a phone call.” Typing a map address while in traffic, now common behavior, will be treated by many troopers as a violation, he said. Q. Is driving under the influence of electronics (DUI-E) a primary offense? Yes. A police officer can pull someone over, merely based on seeing a motorist use a handheld device, type, or watch video. Q. How much does a ticket cost? The fine is $136 for the first offense. For additional violations within five years, the fine increases to $234 per citation. Probably, if you‘ve been found guilty of other traffic violations. Distracted-driving citations will be reported in state driving records, unlike the previous law. Insurance companies will track them. Rate hikes would vary by driver, said Kenton Brine, president of the NW Insurance Council. “I think the bigger issue for the insurer is whether they see multiple tickets over an extended period of time,” he said. Q. What about other distractions? Miscellaneous distractions such as grooming or eating are a secondary offense, meaning a ticket may be issued if a law-enforcement officer pulls you over for some other offense, such as speeding or a dangerous lane change. The standard fine is $99 — which is more than the $30 mentioned in the legislation, and past news reports. The higher total, like the electronic-distraction penalty, includes fees for state government and trauma care. “Embracing another while driving” has been illegal since 1927. If a cop sees your arm around someone so both hands can’t reach the wheel, that’s a reckless-driving offense. Q. I raise my cellphone near my hearing aid. Is that OK? This was legal under an exemption in the 2007 distraction law — which the new law eliminates Sunday. Bluetooth devices have been developed for hearing-impaired people, while the Washington Traffic Safety Commission sought fewer exceptions, so police can effectively apply DUI-E rules. “There is no right to use a phone while driving,” said Shelly Baldwin, WTSC government liaison. Q. Is the law really enforceable? Washington state is home to 5.7 million licensed drivers and 165 million miles of travel miles daily. Roadway observations find 10 percent of drivers on the road are handling a phone. There’s no way for police to watch everyone. Early this year, as few as a half-dozen State Patrol troopers covered some shifts in the entire Eastside detachment, from the floating bridges to Snoqualmie Pass. Statewide there were 89 vacancies of 671 trooper positions, though that should improve with two academy classes and pay raises this year. Seattle’s traffic division of 58 officers already can’t meet public demand to clear gridlocked intersections and bus lanes, or enforce 20-mph school zones, or maintain bikeways or sidewalks. So cultural change is required, plus technology to replaceor block hazardous behavior. Sponsors point to Washington’s 95 percent seat-belt use rate as hope smartphone laws can take root. Even during a grace period, drivers statewide will still be cited under older laws that forbid using a cellphone at the ear, and texting. For perspective, about 39,000 tickets were issued statewide per year under the old law, while drivers caught by troopers had a 50-50 chance of getting off with just a warning. Q. Why a grace period? The legislation originally had a compromise clause that delayed enforcement until Jan. 1, 2019, but Gov. Jay Inslee vetoed that section of the bill. “He essentially vetoed the education part of the bill,” said state Rep. Dave Hayes, R-Camano Island, who opposed early versions of the bill but voted yes after sponsors included his amendment to add nonelectronic distractions. As a result, the law goes into effect Sunday, 90 days after the end of the Legislature’s regular session. Hayes is glad the State Patrol is waiting a while to write tickets. That soft launch is also supported by the Washington Traffic Safety Commission, which has only $350,000 for publicity. “I think in the end, it’s going to be a good bill,” Hayes said. Among other reasons, Moore said the grace period gives people time to buy a hands-free device. However, the National Safety Council cites research showing that even hands-free use consumes one-third of brain capacity to process moving objects. CEO Deborah Hersman recommends a ban on built-in devices. A few more customers than usual are asking for Bluetooth devices this month at El Garage Car Stereo in White Center, said owner Gaspar Tellez, who installs 20 to 25 per month. Dutton Clarke, owner of Stereo Warehouse on Aurora Avenue North, said customers usually acquire hands-free calling bundled with their sound systems, not a separate order. Most entry-level $80 decks include phone software, he said. Or they can buy $200 systems that include navigation, touch screens and the frequently-requested backup cameras. What he hasn’t noticed is a summer rush to beat the distracted-driving bill.